It looks like trouble is brewing in Sakhmet, with all of the main Neopian rulers invited by Princess Amira to a meeting, someone has crept into the palace and stolen items from each of the distinguished guests. Each day a new clue will be released to help you determine who stole each item. 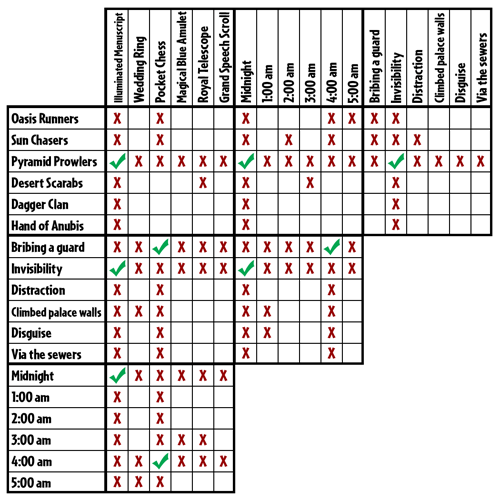 It seems that it doesn't matter which option you choose when trying to get the clue, with each option resulting in the character giving up their clue. If you have a jnAccount, you can save your grid and come back to it each day to update. (Don't have an account? Register!) You can also use the grid as a guest--it just won't be saved when you next visit. After receiving each day's clue, you will be rewarded with a random Neopoint item, along with a Parchment Piece for the NC component. For a full rundown of the NC component of Desert Diplomacy, check out our Desert Diplomacy Parchments guide. Every method except for Invisibility and Bribing methods are marked as X's for the Illuminated Menuscript item. Right off the bat, we can mark off Pyramid Prowlers as not using the 'Bribing' method. Based on Clue #2, we can determine that the 'Bribing' guild stole the Pocket Chess since they did not steal their item first (Midnight) - let's cross-fill those X's! Pocket Chess is also marked off for Midnight since it's now tied to the 'Bribing' guild. Clue 6: Another 'this nor that'. Clue 7: Another 'this nor that'. Clue 8: Another useful, but dormant clue. The Dagger Clan did not steal first - Midnight is already marked off. Based on their relationship to the 'Bribing' guild, Oasis Runners and Sun Chasers can be marked off for 4:00 AM. �The guild that committed the theft at 1:00 AM did not use a disguise. Clue 11: Break out the green checkmarks! Based on the 1:00 AM clues, Dagger Clan can be marked off for 'Bribing', 'Climbing', 'Disguise' and Pocket Chess. Backtracking: Complex process of elimination. According to Clue #3, if the 'Distraction' guild had been the 5:00 AM thieves, then the Sun Chasers would have stolen the Wedding Ring at 3:00 AM. Clue #4 states that the 'Climbing' guild would have stolen their item after the Wedding Ring's theft - however the only possible time the 'Climbing' guild would have after 3:00 AM is 5:00 AM - which in this example is held by the 'Distraction' guild. Therefore, the scenario where the 'Distraction' guild are the 5:00 AM thieves is not possible. 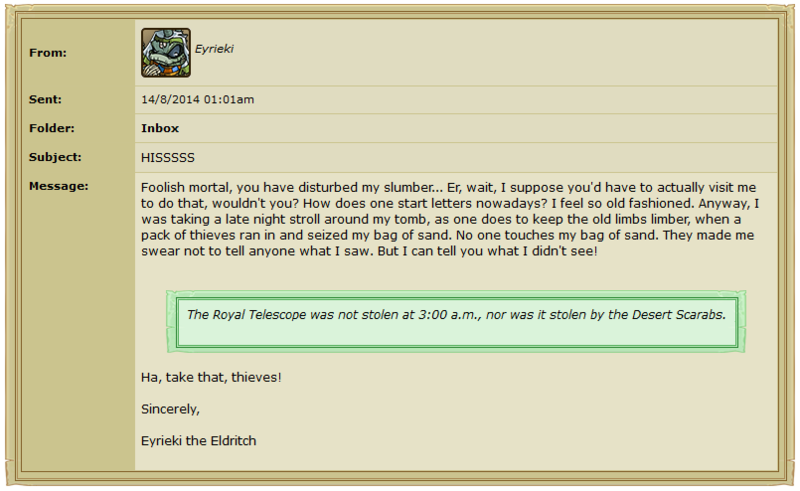 The Hand of the Anubis did not steal at 2:00 AM as earliest possible time the 'Disguise' guild stole their item is at 2:00 AM. Based on Clue #6, we can determine that The Hand of the Anubis did not steal the Magical Blue Amulet. The 'Climbing' and 'Disguise' guild each stole either the Magical Blue Amulet or Royal Telescope. Therefore, neither of these items could have been stolen at 1:00 AM nor 3:00 AM for both parties. Based on previous clues, Grand Speech Scroll can be marked off for Sun Chasers and 5:00 AM. Wedding Ring and Grand Speech Scroll can be marked off for 2:00 AM since it's only possible for either the Magical Blue Amulet or Royal Telescope to be stolen at this time. Likewise, as the identities of both of the 2:00 AM and 5:00 AM thieves have been revealed, the Dagger Clan and Hand of the Anubis can be marked off for the Magical Blue Amulet and Royal Telescope. The 'Sewer' guild is revealed to be the Hand of the Anubis, the 3:00 AM thieves. 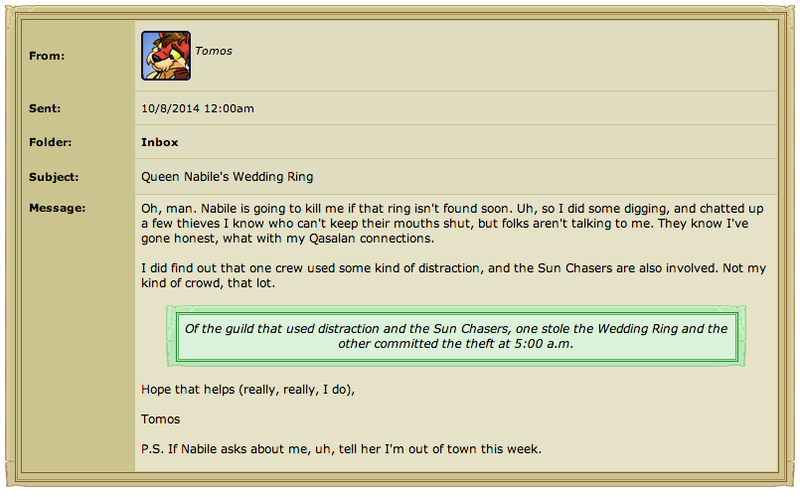 Finally, the Dagger Clan is revealed to be the 1:00 AM Wedding Ring thieves. There were four days to submit a guess. Each user was given a different item to guess which guild stole, at which time and using which method. The number of prizes each guesser received depended on how early they submitted their answer. Those who didn't submit a guess were also rewarded if they collected at least one piece of evidence. Those who submitted the correct guild, time and method for their item also received the Honorary Guard Tunic.